Vacation in the Heart of Chesapeake Country. Get away from it all for your next vacation and retreat to the quiet pleasures of Chesapeake living. Enjoy the natural wonder of the Nanticoke River and Chesapeake Bay in our 80 acre private bay front nature preserve complete with a long private white sand beach. Whether you seek fishing, boating, hunting, birding, or just plain relaxing, you will find it here only a three hour drive from Washington DC. Your retreat is our own vacation home, a 3 bedroom, one bath private home tucked in the back-country of Maryland's Eastern Shore. You can enjoy this undiscovered corner of Chesapeake country all by your lonesome as this is a single family home and you will have the property and beach for your own private use. Please, no smoking within the home. It only feels like wilderness. Right out the back door is 80 acres of nature lover's delight. Enjoy gorgeous sunsets over the river, quite wooded paths, meadows, broad vistas of classic Chesapeake salt marsh and, best of all, a full half mile of your own private unspoiled sandy beach where you can enjoy the views and breezes of the Nanticoke River. Tranquility is guaranteed. Civilization is a 20 minute drive away in the city of Salisbury. Owners: Curt and Amy Jo Watkins. We fell in love with Chesapeake country when a job opportunity brought us to Maryland in 1996. We were fortunate to find and purchase a unspoiled waterfront property on the Bay and lived in the home for 10 years until our family grew and we moved 'to the city' to be closer to work and schools. We loved the bay front setting so much we held onto 'our vacation house' and are happy to share the natural beauty of the property with our guests. 80 acre park like setting. Enjoy wooded paths, a pond, sandy beach and swimming in the river . 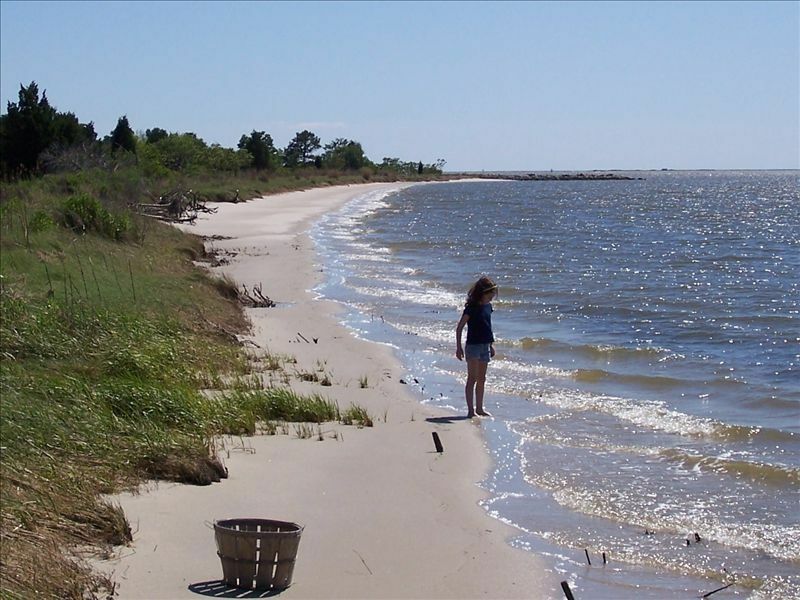 Property includes a long private sandy beach on the Nanticoke River/Chesapeake bay. The beach and river are not visible from the home. Private ½ mile long white sand beach, Stunning sunsets over the river. A wonderful place to enjoy family time! What a lovely place in great a community! All amenities covered and the property is amazing even in the winter! Wonderful waterfront retreat with thoughtful hosts. Spacious and cheerful with bright sunroom with views of the acreage. We saw a buck, bunny, butterflies, and several varieties of birds. Because of the large size of the land, the water is a distance from the house but it is a short drive or longer walk. Due to large amounts of rain the week we visited, the water was over the beach but we enjoyed the gorgeous land. The decor is not fancy, but extremely comfortable. The hosts have provided games, toys, movies and satellite TV. There is a small game room with Foos ball. Quiet, quiet and more quiet! We enjoyed our stay in this fully equipped house. The property is lovely and the private beach is just the best. Assateague National Seashore is just a short drive away, as is Ocean City if you need noise and tourists. Local produce was abundant so we ate well. No internet or cell service was a blessing and a curse since it was hard to get information about restaurants and activities. Thank goodness for the central air conditioning because it was really hot in MD. Thank you for your kind review. While it is true the home does not have wi-if internet service, it is inaccurate to say there is no cellular service. Admittedly cell service is weak, but generally a signal can be achieved by stepping out of the house. Such is the inconvenience of visiting a rural setting! Very cool place to get away from everything. It's a nice house with private beach access that you can drive to. It's really not near anything so I loved just swimming, crabbing, fishing, and looking for pottery shards. The bugs can be bad but on the beach we were fine till late evening. My son loved the water and since he's only 2 the light surf was a plus. Also caught a composed ray that had to be 40+ pounds which made my day. Overall loved it and will try to come down again. Our second stay. Things were perfect. Could not ask for a better time. House was well maintained and owners are very helpful. If you stay try The Red Roost restaurant. Holiday rate $1500 for the week of 4th of July. Weekly rentals are preferred. "Off season" weekends (Three nights) available for $350. Weekends during the summer season made available two weeks in advance if unbooked. Summer weekend rate is $500, subject to availability. Call or email for details.